"1914 – The Khaki Chum's Christmas Truce – 1999 – 85 Years – Lest We Forget"
The Christmas truce occurred during the relatively early period of the war (month 5 of 51). Hostilities had entered somewhat of a lull as leadership on both sides reconsidered their strategies following the stalemate of the Race to the Sea and the indecisive result of the First Battle of Ypres. In the week leading up to the 25th, French, German, and British soldiers crossed trenches to exchange seasonal greetings and talk. In some areas, men from both sides ventured into no man's land on Christmas Eve and Christmas Day to mingle and exchange food and souvenirs. There were joint burial ceremonies and prisoner swaps, while several meetings ended in carol-singing. Men played games of football with one another, giving one of the most memorable images of the truce. Peaceful behaviour was not ubiquitous; fighting continued in some sectors, while in others the sides settled on little more than arrangements to recover bodies. The following year, a few units arranged ceasefires but the truces were not nearly as widespread as in 1914; this was, in part, due to strongly worded orders from the high commands of both sides prohibiting truces. Soldiers were no longer amenable to truce by 1916. The war had become increasingly bitter after devastating human losses suffered during the battles of the Somme and Verdun, and the use of poison gas. The truces were not unique to the Christmas period, and reflected a mood of "live and let live", where infantry close together would stop overtly aggressive behaviour and often engage in small-scale fraternisation, engaging in conversation or bartering for cigarettes. In some sectors, there would be occasional ceasefires to allow soldiers to go between the lines and recover wounded or dead comrades, while in others, there would be a tacit agreement not to shoot while men rested, exercised or worked in full view of the enemy. The Christmas truces were particularly significant due to the number of men involved and the level of their participation—even in very peaceful sectors, dozens of men openly congregating in daylight was remarkable—and are often seen as a symbolic moment of peace and humanity amidst one of the most violent events of human history. During the first five months of World War I, the German attack through Belgium into France had been repelled outside Paris by French and British troops at the Battle of the Marne in early September 1914. The Germans fell back to the Aisne valley, where they prepared defensive positions. In the subsequent Battle of the Aisne, the Allied forces were unable to push through the German line, and the fighting quickly degenerated into a stalemate; neither side was willing to give ground, and both started to develop fortified systems of trenches. To the north, on the right of the German army, there had been no defined front line, and both sides quickly began to try to use this gap to outflank one another. In the ensuing "Race to the Sea", the two sides repeatedly clashed, each trying to push forward and threaten the end of the other's line. After several months of fighting, during which the British forces were withdrawn from the Aisne and sent north into Flanders, the northern flank had developed into a similar stalemate. By November, there was a continuous front line running from the North Sea to the Swiss frontier, occupied on both sides by armies in prepared defensive positions. In the lead up to Christmas 1914, there were several peace initiatives. The Open Christmas Letter was a public message for peace addressed "To the Women of Germany and Austria", signed by a group of 101 British women suffragettes at the end of 1914 as the first Christmas of World War I approached. Pope Benedict XV, on 7 December 1914, had begged for an official truce between the warring governments. He asked "that the guns may fall silent at least upon the night the angels sang." This attempt was officially rebuffed. Fraternisation—peaceful and sometimes friendly interactions between opposing forces—was a regular feature in quiet front-line sectors of the Western Front. In some areas, it manifested as a passive inactivity, where both sides would refrain from overtly aggressive or threatening behaviour, while in other cases it extended to regular conversation or even visits from one trench to another. Truces between British and German units can be dated to early November 1914, around the time opposing armies had begun static trench warfare. At this time, both sides' rations were brought up to the front line after dusk, and soldiers on both sides noted a period of peace while they collected their food. By 1 December, a British soldier could record a friendly visit from a German sergeant one morning "to see how we were getting on". Relations between French and German units were generally more tense, but the same phenomenon began to emerge. In early December, a German surgeon recorded a regular half-hourly truce each evening to recover dead soldiers for burial, during which French and German soldiers exchanged newspapers. This behaviour was often challenged by junior and senior officers; the young Charles de Gaulle wrote on 7 December of the "lamentable" desire of French infantrymen to leave the enemy in peace, while the commander of 10th Army, Victor d'Urbal, wrote of the "unfortunate consequences" when men "become familiar with their neighbours opposite". Other truces could be enforced on both sides by weather conditions, especially when trench lines flooded in low-lying areas, though these often lasted after the weather had cleared. On the Eastern Front, Fritz Kreisler reported incidents of spontaneous truces and fraternisation between the Austro-Hungarians and Russians in the first few weeks of the war. The proximity of trench lines made it easy for soldiers to shout greetings to each other, and this may have been the most common method of arranging informal truces during 1914. Men would frequently exchange news or greetings, helped by a common language; many German soldiers had lived in England, particularly London, and were familiar with the language and the culture. Several British soldiers recorded instances of Germans asking about news from the football leagues, while other conversations could be as banal as discussions of the weather or as plaintive as messages for a sweetheart. One unusual phenomenon that grew in intensity was music; in peaceful sectors, it was not uncommon for units to sing in the evenings, sometimes deliberately with an eye towards entertaining or gently taunting their opposite numbers. This shaded gently into more festive activity; in early December, Sir Edward Hulse of the Scots Guards wrote that he was planning to organise a concert party for Christmas Day, which would "give the enemy every conceivable form of song in harmony" in response to frequent choruses of Deutschland Über Alles. On Christmas Day, Brigadier-General Walter Congreve, then commanding 18 Infantry Brigade, stationed near Neuve Chapelle, wrote a letter recalling the Germans initiated by calling a truce for the day. One of his brigade's men bravely lifted his head above the parapet and others from both sides walked onto no man's land. Officers and men shook hands and exchanged cigarettes and cigars, one of his captains "smoked a cigar with the best shot in the German army", the latter no more than 18 years old. Congreve admitted he was reluctant to personally witness the scene of the truce for fear he would be a prime target for German snipers. I wouldn't have missed that unique and weird Christmas Day for anything.... I spotted a German officer, some sort of lieutenant I should think, and being a bit of a collector, I intimated to him that I had taken a fancy to some of his buttons.... I brought out my wire clippers and, with a few deft snips, removed a couple of his buttons and put them in my pocket. I then gave him two of mine in exchange.... The last I saw was one of my machine gunners, who was a bit of an amateur hairdresser in civil life, cutting the unnaturally long hair of a docile Boche, who was patiently kneeling on the ground whilst the automatic clippers crept up the back of his neck. Dear Mother, I am writing from the trenches. It is 11 o'clock in the morning. Beside me is a coke fire, opposite me a 'dug-out' (wet) with straw in it. The ground is sloppy in the actual trench, but frozen elsewhere. In my mouth is a pipe presented by the Princess Mary. In the pipe is tobacco. Of course, you say. But wait. In the pipe is German tobacco. Haha, you say, from a prisoner or found in a captured trench. Oh dear, no! From a German soldier. Yes a live German soldier from his own trench. 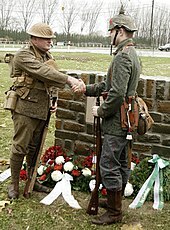 Yesterday the British & Germans met & shook hands in the Ground between the trenches, & exchanged souvenirs, & shook hands. Yes, all day Xmas day, & as I write. Marvellous, isn't it? Captain Sir Edward Hulse reported how the first interpreter he met from the German lines was from Suffolk where he had left his girlfriend and a 3.5 hp motorcycle. Hulse went on to describe a sing-song which "ended up with 'Auld lang syne' which we all, English, Scots, Irish, Prussians, Württenbergers, etc, joined in. It was absolutely astounding, and if I had seen it on a cinematograph film I should have sworn that it was faked!" Friday (Christmas Day). We are having the most extraordinary Christmas Day imaginable. A sort of unarranged and quite unauthorized but perfectly understood and scrupulously observed truce exists between us and our friends in front. The funny thing is it only seems to exist in this part of the battle line – on our right and left we can all hear them firing away as cheerfully as ever. The thing started last night – a bitter cold night, with white frost – soon after dusk when the Germans started shouting 'Merry Christmas, Englishmen' to us. Of course our fellows shouted back and presently large numbers of both sides had left their trenches, unarmed, and met in the debatable, shot-riddled, no man's land between the lines. Here the agreement – all on their own – came to be made that we should not fire at each other until after midnight tonight. The men were all fraternizing in the middle (we naturally did not allow them too close to our line) and swapped cigarettes and lies in the utmost good fellowship. Not a shot was fired all night. Of the Germans he wrote: "They are distinctly bored with the war.... In fact, one of them wanted to know what on earth we were doing here fighting them." The truce in that sector continued into Boxing Day; he commented about the Germans, "The beggars simply disregard all our warnings to get down from off their parapet, so things are at a deadlock. We can't shoot them in cold blood.... I cannot see how we can get them to return to business." I remember the silence, the eerie sound of silence. Only the guards were on duty. We all went outside the farm buildings and just stood listening. And, of course, thinking of people back home. All I'd heard for two months in the trenches was the hissing, cracking and whining of bullets in flight, machinegun fire and distant German voices. But there was a dead silence that morning, right across the land as far as you could see. We shouted 'Merry Christmas', even though nobody felt merry. The silence ended early in the afternoon and the killing started again. It was a short peace in a terrible war. Nor were the observations confined to the British. German Lieutenant Johannes Niemann wrote: "grabbed my binoculars and looking cautiously over the parapet saw the incredible sight of our soldiers exchanging cigarettes, schnapps and chocolate with the enemy." General Sir Horace Smith-Dorrien, commander of the British II Corps, issued orders forbidding friendly communication with the opposing German troops. Adolf Hitler, then a young corporal of the 16th Bavarian Reserve Infantry, was also an opponent of the truce. In sections of the front where German and Belgian troops faced each other in December 1914, there was at least one such instance when a truce was achieved at the request of Belgian soldiers who wished to send letters back to their families, over the German-occupied parts of their own country. Richard Schirrmann, who was in a German regiment holding a position on the Bernhardstein, one of the mountains of the Vosges, wrote an account of events in December 1915: "When the Christmas bells sounded in the villages of the Vosges behind the lines... something fantastically unmilitary occurred. German and French troops spontaneously made peace and ceased hostilities; they visited each other through disused trench tunnels, and exchanged wine, cognac and cigarettes for Westphalian black bread, biscuits and ham. This suited them so well that they remained good friends even after Christmas was over." He was separated from the French troops by a narrow No Man's Land and described the landscape as: "Strewn with shattered trees, the ground ploughed up by shellfire, a wilderness of earth, tree-roots and tattered uniforms." Military discipline was soon restored, but Schirrmann pondered over the incident, and whether "thoughtful young people of all countries could be provided with suitable meeting places where they could get to know each other." He went on to found the German Youth Hostel Association in 1919. Many accounts of the battle involve one or more football matches played in no-man's land. This was mentioned in some of the earliest reports, with a letter written by a doctor attached to the Rifle Brigade, published in The Times on 1 January 1915, reported "a football match... played between them and us in front of the trench". A wide range of similar stories have been told over the years, often naming specific units or a precise score. Some accounts of the game bring in elements of fiction by Robert Graves, a British poet and writer (and an officer on the front at the time) who reconstructed the encounter in a story published in 1962; in Graves's version, the score was 3–2 to the Germans. However, the truth of the accounts has been disputed by some historians; in 1984, Malcolm Brown and Shirley Seaton concluded that there were probably attempts to play organised matches which failed due to the state of the ground, but that the contemporary reports were either hearsay or refer to "kick-about" matches with "made-up footballs" such as a bully-beef tin. Chris Baker, former chairman of The Western Front Association and author of The Truce: The Day the War Stopped is also sceptical, but says that although there is little hard evidence, the most likely place that an organised match could have taken place was near the village of Messines: "There are two references to a game being played on the British side, but nothing from the Germans. If somebody one day found a letter from a German soldier who was in that area, then we would have something credible." In fact, there is a German reference. Lieutenant Kurt Zehmisch of Germany's 134th Saxons Infantry Regiment said that the English "brought a soccer ball from their trenches, and pretty soon a lively game ensued. How marvelously wonderful, yet how strange it was". In 2011, Mike Dash concluded that "there is plenty of evidence that football was played that Christmas Day—mostly by men of the same nationality, but in at least three or four places between troops from the opposing armies". A wide variety of units were reported in contemporary accounts to have taken part in games; Dash listed the 133rd Royal Saxon Regiment pitched against "Scottish troops"; the Argyll and Sutherland Highlanders against unidentified Germans (with the Scots reported to have won 4–1); the Royal Field Artillery against "Prussians and Hanovers" near Ypres; and the Lancashire Fusiliers, based near Le Touquet, with the specific detail of a bully beef ration tin as the "ball". One recent writer has identified 29 separate reports of football, though does not give substantive details. Colonel J. E. B. Seely recorded in his diary for Christmas Day that he had been "Invited to football match between Saxons and English on New Year's Day", but this does not appear to have taken place. A separate manifestation of the Christmas truce in December 1914 occurred on the Eastern front, where the first move originated from the Austro-Hungarian commanders, at some uncertain level of the military hierarchy. The Russians responded positively and soldiers eventually met in no man's land. The events of the truce were not reported for a week, in an unofficial press embargo which was eventually broken by The New York Times, published in the then-neutral United States, on 31 December. The British papers quickly followed, printing numerous first-hand accounts from soldiers in the field, taken from letters home to their families, and editorials on "one of the greatest surprises of a surprising war". By 8 January pictures had made their way to the press, and both the Mirror and Sketch printed front-page photographs of British and German troops mingling and singing between the lines. The tone of the reporting was strongly positive, with the Times endorsing the "lack of malice" felt by both sides and the Mirror regretting that the "absurdity and the tragedy" would begin again. Coverage in Germany was more muted, with some newspapers strongly criticising those who had taken part, and no pictures published. In France, meanwhile, the greater level of press censorship ensured that the only word that spread of the truce came from soldiers at the front or first-hand accounts told by wounded men in hospitals. The press was eventually forced to respond to the growing rumours by reprinting a government notice that fraternising with the enemy constituted treason, and in early January an official statement on the truce was published, claiming it had happened on restricted sectors of the British front, and amounted to little more than an exchange of songs which quickly degenerated into shooting. The press of then-neutral Italy published a few articles on the events of the truce, usually reporting the articles of the foreign press. On 30 December 1914, Corriere della Sera printed a report about a fraternization between the opposing trenches. The Florentine newspaper La Nazione published a first-hand account about a football match played in the no man's land. In Italy, the lack of interest in the truce probably depended on the occurrence of other events, such as the Italian occupation of Vlorë, the debut of the Garibaldi Legion on the front of the Argonne and, finally, the earthquake in Avezzano. British and German troops burying the bodies of those killed in the attack of 18 December. After Christmas 1914, sporadic attempts were made at seasonal truces; a German unit attempted to leave their trenches under a flag of truce on Easter Sunday 1915, but were warned off by the British opposite them, and later in the year, in November, a Saxon unit briefly fraternised with a Liverpool battalion. In December 1915, there were explicit orders by the Allied commanders to forestall any repeat of the previous Christmas truce. Individual units were encouraged to mount raids and harass the enemy line, whilst communicating with the enemy was discouraged by artillery barrages along the front line throughout the day. The prohibition was not completely effective, however, and a small number of brief truces occurred. An eyewitness account of one truce, by Llewelyn Wyn Griffith, recorded that after a night of exchanging carols, dawn on Christmas Day saw a "rush of men from both sides... [and] a feverish exchange of souvenirs" before the men were quickly called back by their officers, with offers to hold a ceasefire for the day and to play a football match. It came to nothing, as the brigade commander threatened repercussions for the lack of discipline, and insisted on a resumption of firing in the afternoon. Nevertheless, another member of Griffith's battalion, Bertie Felstead, later recalled that one man had produced a football, resulting in "a free-for-all; there could have been 50 on each side", before they were ordered back. Another unnamed participant reported in a letter home: "The Germans seem to be very nice chaps, and said they were awfully sick of the war." In the evening, according to Robert Keating, another eyewitness, "The Germans were sending up star lights and singing – they stopped, so we cheered them & we began singing Land of Hope and Glory – Men of Harlech et cetera – we stopped and they cheered us. So we went on till the early hours of the morning." In an adjacent sector, a short truce to bury the dead between the lines led to official repercussions; a company commander, Sir Iain Colquhoun of the Scots Guards, was court-martialled for defying standing orders to the contrary. While he was found guilty and reprimanded, the punishment was annulled by General Haig and Colquhoun remained in his position; the official leniency may perhaps have been because his wife's uncle was H. H. Asquith, the Prime Minister. In the Decembers of 1916 and 1917, German overtures to the British for truces were recorded without any success. In some French sectors, singing and an exchange of thrown gifts was occasionally recorded, though these may simply have reflected a seasonal extension of the live-and-let-live approach common in the trenches. At Easter 1915 there were recorded instances of truces between Orthodox troops of opposing sides on the Eastern front. The Bulgarian writer Yordan Yovkov, serving as an officer near the Greek border at the Mesta river, witnessed one such truce. It inspired his short story "Holy Night", translated into English in 2013 by Krastu Banaev. 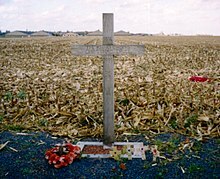 Although the popular tendency has been to see the December 1914 Christmas Truces as unique and therefore of romantic rather than political significance, they have also been interpreted as part of the widespread non-co-operation with the war spirit and conduct by serving soldiers. In his book on trench warfare, historian Tony Ashworth describes what he calls the 'live and let live system'. Complicated local truces and agreements not to fire at each other were developed by men along the front throughout the war. These often began with agreement not to attack each other at tea, meal or washing times, and in some places became so developed that whole sections of the front would see few casualties for extended periods of time. This system, Ashworth argues, 'gave soldiers some control over the conditions of their existence.' The December 1914 Christmas Truces then can be seen as not unique, but as the most dramatic example of non-co-operation with the war spirit that included refusal to fight, unofficial truces, mutinies, strikes, and peace protests. In the 1933 play Petermann schließt Frieden oder Das Gleichnis vom deutschen Opfer (Petermann makes peace: or, the parable of German sacrifice), written by Nazi writer and World War I veteran Heinz Steguweit (in German), a German soldier, accompanied by Christmas carols sung by his comrades, erects an illuminated Christmas tree between the trenches, but is shot dead by the enemy. Later, when the fellow soldiers find his body, they notice in horror that enemy snipers have shot down every single Christmas light from the tree. The 1967 song "Snoopy's Christmas" by the Royal Guardsmen was based on the Christmas truce. It is the Red Baron, Germany's ace pilot and war hero, who initiates the truce with the fictitious Snoopy. The 1969 film Oh! What a Lovely War includes a scene of a Christmas truce with British and German soldiers sharing jokes, alcohol and songs. The video for the 1983 song "Pipes of Peace" by Paul McCartney depicts a fictionalised version of the Christmas truce. John McCutcheon's 1984 song, Christmas in the Trenches, tells the story of the 1914 truce through the eyes of a fictional soldier. Performing the song he met German veterans of the truce. The final episode of the BBC television series Blackadder Goes Forth references the Christmas truce, with the main character Edmund Blackadder having played in a football match. He is also seen being annoyed at having had a goal disallowed for offside. The song "All Together Now" by Liverpool band The Farm took its inspiration from the Christmas Day Truce of 1914. The song has been re-recorded by The Peace Collective for release in December 2014 to mark the centenary of the event. The 1997 song "Belleau Wood" by American country music artist Garth Brooks is a fictional account based on the Christmas truce. The truce is dramatised in the 2005 French film Joyeux Noël (English: Merry Christmas), depicted through the eyes of French, British and German soldiers. The film, written and directed by Christian Carion, was screened out of competition at the 2005 Cannes Film Festival. In 2008, the truce was depicted on stage at the Pantages Theater in Minneapolis, in the radio musical drama All Is Calm: The Christmas Truce of 1914. It was created and directed by Peter Rothstein, and co-produced by Theater Latté Da and the vocal ensemble Cantus, both Minneapolis-based organisations. It has continued to play at the Pantages Theater each December since its premiere. On November 12, 2011, the opera "Silent Night", commissioned by the Minnesota Opera, had its world premiere at the Ordway Center for the Performing Arts in St. Paul, Minnesota. With libretto by Mark Campbell, based on the screenplay of the film "Joyeux Noel", and with music by Kevin Puts, it won the 2012 Pulitzer Prize for Music, and has been performed or scheduled for more than 20 productions around the world as of 2018's 100th anniversary of the Armistice. Ahead of the centenary of the truce (December 2014), English composer Chris Eaton and singer Abby Scott produced the song, 1914 – The Carol of Christmas, to benefit British armed forces charities. At 5 December 2014, it had reached top of the iTunes Christmas chart. In 2014, the Northumbria and Newcastle Universities Martin Luther King Peace Committee produced resources to enable schools and churches to mark the December 1914 Christmas Truces. These included lesson plans, hand-outs, worksheets, PowerPoint slide shows, and full plans for assemblies, and carol services/Christmas productions. The authors explained that their purpose was both to enable schoolteachers to help children learn about the remarkable events of December 1914, but also to use the theme of Christmas to provide a counterpoint to the UK government's glorification of the First World War as heroic. As the Peace Committee argues, "These spontaneous acts of festive goodwill directly contradicted orders from high command, and offered an evocative and hopeful – albeit brief – recognition of shared humanity" – and thereby, they argue, give a rereading of the traditional Christmas message of "on earth peace, good will toward men." The grocery chain Sainsbury's produced a short film for the 2014 Christmas season as an advertisement re-enacting the events of the Christmas truce, primarily following a young English soldier in the trenches. In the Doctor Who 2017 Christmas Special "Twice Upon a Time", the First and Twelfth Doctors become unwittingly involved in the fate of a British captain who is seemingly destined to die in a confrontation in No Man's Land before he is taken out of time, only for the Twelfth Doctor to bend the rules and return the captain — revealed to be a relative of his friend and ally Brigadier Lethbridge-Stewart — to a point a couple of hours after he was taken out of time. This slight bending of the rules results in the captain being returned to history at the beginning of the Christmas truce, allowing the captain to live and request aid for his would-be killer, the Twelfth Doctor musing that such a truce was the only time such a thing happened in history but it never hurts to ensure that there will be a couple of fewer dead people on a battlefield. A Christmas truce memorial was unveiled in Frelinghien, France, on 11 November 2008. Also on that day, at the spot where, on Christmas Day 1914, their regimental ancestors came out from their trenches to play football, men from the 1st Battalion, The Royal Welch Fusiliers played a football match with the German Battalion 371. The Germans won 2–1. On 12 December 2014, a memorial was unveiled at the National Memorial Arboretum in Staffordshire, England by Prince William, Duke of Cambridge and the England national football team manager Roy Hodgson. The Football Remembers memorial was designed by a ten-year-old schoolboy, Spencer Turner, after a UK-wide competition. The Midway Village in Rockford, Illinois has hosted re-enactments of the Christmas Truce. ^ "England v Germany: when rivals staged beautiful game on the Somme"
^ Oldfield, Sybil. International Woman Suffrage: November 1914 – September 1916. Taylor & Francis, 2003. ISBN 0-415-25738-7. Volume 2 of International Woman Suffrage: Jus Suffragii, 1913–1920, Sybil Oldfield, ISBN 0-415-25736-0 p. 46. ^ "Demystifying the Christmas Truce", Thomas Löwer, The Heritage of the Great War, retrieved 27 December 2009. ^ "Miracles brighten Christmas", Harrison Daily Times, 24 December 2009. ^ a b "Remembering a Victory For Human Kindness – WWI's Puzzling, Poignant Christmas Truce", David Brown, The Washington Post, 25 December 2004. ^ Ashworth (2000), p. 22. ^ Kreisler, Fritz. Four Weeks in the Trenches. Accessed January 23, 2018. http://www.gwpda.org/memoir/Kreisler/Kreisler.htm. ^ Bridget Harris (27 December 2009). "All Together Now for England". The Epoch Times. Archived from the original on 18 September 2012. Retrieved 7 January 2010. ^ "General's letter from trenches". Shropshire Star. 5 December 2014. p. 12. The letter describing the events had been published after discovery by Staffordshire County Council's archive service. ^ "Bullets & Billets by Bruce Bairnsfather", Project Gutenberg, retrieved 31 December 2009. ^ "Seasons over the decades, 1914". Shropshire Star. 26 December 2014. p. 18. Article by Toby Neal. The Shropshire Star replaced the Wellington Journal. ^ Interview from 2003 Archived 17 December 2005 at the Wayback Machine, originally published in The Scotsman, 25 June 2003, under the headline "Scotland's Oldest Man turns 107", by John Innes. ^ Richard Schirrmann: The first youth hosteller: A biographical sketch by Graham Heath (1962, International Youth Hostel Association, Copenhagen, in English). ^ a b c d Mike Dash. "Peace on the Western Front, Goodwill in No Man's Land — The Story of the World War I Christmas Truce". Smithsonian.com. ^ Stephen Moss. "Truce in the trenches was real, but football tales are a shot in the dark". the Guardian. ^ "First World War.com – Feature Articles – The Christmas Truce". ^ Scott, Brough (2003). Galloper Jack: a grandson's search for a forgotten hero. London: Macmillan. p. 188. ISBN 0333989384. ^ Weintraub (2001), pp. 179–80. The "greatest surprises" quote is from the South Wales Gazette on 1 January 1915. ^ Cutolo, Francesco (2015). "La tregua di Natale 1914: echi e riflessi in Italia" (PDF). QF. Quaderni di Farestoria. 3: 19–26. ^ ""Echi e riflessi della guerra a Berlino. Cortesie tra nemici"". Corriere della Sera. 30 December 1914. ^ ""Football tra nemici"". La Nazione. 3 January 1915. ^ Brown (2005) pp. 75–76. The unit in question was the 15th Royal Welch Fusiliers, a battalion of the volunteer New Armies, which were just arriving in France for the first time in late 1915 and early 1916. Griffith mentions Christmas Day was "the first time [he] had seen no-man's land"; his men were, quite possibly, also on their first tour in the front lines this day. ^ "Bertie Felstead The last known survivor of no-man's-land football died on July 22, 2001 aged 106". The Economist. 2 August 2001. ^ Riley (2017), p. 722; quoting letter published in Wrexham Advertiser, 9 January 1915. ^ Macdonald, Alastair (24 December 2014). "How Christmas Truce led to court martial". Reuters. Retrieved 27 December 2017. ^ Banaev, Krastu (translator). "Holy Night by Yordan Yovkov ". Sobornost 34, no. 1 (2013): 41–51. ^ Ashworth, Tony. 1980. Trench Warfare 1914–1918: The Live and Let Live System, Pan Grand Strategy. London: Macmillan. ^ Grunberger, Richard (1979). The 12-year Reich: a social history of Nazi Germany, 1933–1945. Holt, Rinehart and Winston. p. 349. ^ "Blackadder Goes Forth. Plan F – Goodbyeee". BBC. Retrieved 18 November 2014. ^ "Under-12 footballers commemorate 100th anniversary of Christmas Truce match". SkySports. ^ Holden, Stephen (3 March 2006). "Joyeux Noel (Merry Christmas) (2005) A Christmas Truce Forged by Germans, French and Scots". The New York Times. Retrieved 31 December 2009. ^ "Joyeux Noël (2005)". IMDb. Retrieved 11 November 2009. ^ "Festival de Cannes: Joyeux Noël". festival-cannes.com. Retrieved 12 December 2009. ^ "Song inspired by Christmas truce of 1914". Shropshire Star. 5 December 2014. p. 12. Report by James Fisher. ^ "Martin Luther King Peace Committee; Martin Luther King Peace Committee; Newcastle University". ^ "World War One Christmas Truce Commemorations; Martin Luther King Peace Committee; Newcastle University". Archived from the original on 18 October 2014. Retrieved 17 September 2014. ^ Bible, King James Version, Luke 2:14. ^ Smith, Mark (13 November 2014). "Sainsbury's Christmas advert recreates first world war truce" – via The Guardian. ^ Sainsbury's (12 November 2014). "Sainsbury's OFFICIAL Christmas 2014 Ad" – via YouTube. ^ "Frelinghien Plaque". Archived from the original on 28 December 2009. Retrieved 11 November 2014. ^ Tumilowicz, Danielle. "Midway Village hosts a reenactment of the Christmas Truce". Archived from the original on 4 March 2016. Retrieved 1 January 2016. Ashworth, Tony (2000). Trench Warfare 1914–1918: the live-and-let-live system. London: Pan. ISBN 0330480685. Brown, Malcolm (2004). 1914: The Men Who Went to War. London: Sidgwick & Jackson. ISBN 0-283-07323-3. Brown, Malcolm; Seaton, Shirley (1984). Christmas Truce: The Western Front, 1914. New York: Hippocrene Books. ISBN 0436071029. Brown, Malcolm (2005). "The Christmas truce 1914: The British Story". Cazals, Rémy (2005). "Good Neighbours". Ferro, Marc (2005). "Russia: Fraternization and Revolution". Mueller, Olaf (2005). "Brother Boche". Dunn, Captain J. C. (1994). The War the Infantry Knew 1914–1919: A Chronicle of Service in France and Belgium. London: Abacus. ISBN 0-349-10635-5. Riley, Jonathon (2017). "'Everyman's land': the second Christmas truce, 1915". Welsh History Review. 28 (4): 711–22. Weintraub, Stanley (2001). Silent Night: The Story of the World War I Christmas truce. London: Pocket. ISBN 0-684-86622-6. Blom Crocker, Terri (2015). The Christmas Truce: Myth, Memory, and the First World War. University Press of Kentucky. ISBN 9780813166155. OCLC 908071881. Eksteins, Modris (2000). The Rites of Spring. New York, NY: Mariner Books. ISBN 9780395937587. Michael, Jürgs (2005). Der kleine Frieden im Großen Krieg: Westfront 1914: als Deutsche, Franzosen und Briten gemeinsam Weihnachten feierten. München: Goldmann. ISBN 3442153034. Riley, Jonathon (2017). "The second Christmas truce, 1915". Transactions of the Honourable Society of Cymmrodorion. n.s. 23: 127–39. Snow, Michael (2009). Oh Holy Night: The Peace of 1914. ISBN 9781616230807. Wikimedia Commons has media related to Christmas Truce 1914. Understanding the 1914 Christmas Truce and the evidence for football by Simon Jones. Simple Gifts: 25 December 1914 on YouTube – R.O. Blechman presents Simple Gifts (1977 animation TV special) DECEMBER 25, 1914 segment inspired by the legendary Christmas Truce. Captain Hulse's letter narrated by David Jones. Private Ronald Mackinnon letter from the truce of 1916. Alexandre Lafon: Christmas Truce, in: 1914-1918-online. International Encyclopedia of the First World War. This page was last edited on 18 March 2019, at 20:38 (UTC).